Curved lenses, like those in cameras or telescopes, are stacked in order to reduce distortions and resolve a clear image. That’s why high-power microscopes are so big and telephoto lenses so long. While lens technology has come a long way, it is still difficult to make a compact and thin lens (rub a finger over the back of a cellphone and you’ll get a sense of how difficult). But what if you could replace those stacks with a single flat — or planar — lens? 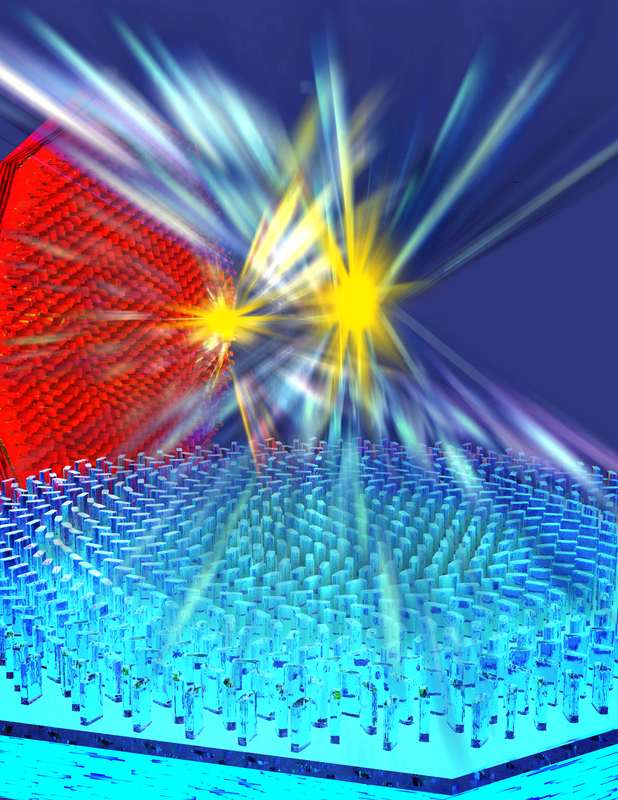 Researchers from the Harvard John A. Paulson School of Engineering and Applied Sciences (SEAS) have demonstrated the first planar lens that works with high efficiency within the visible spectrum of light — covering the whole range of colors from red to blue. The lens can resolve nanoscale features separated by distances smaller than the wavelength of light. 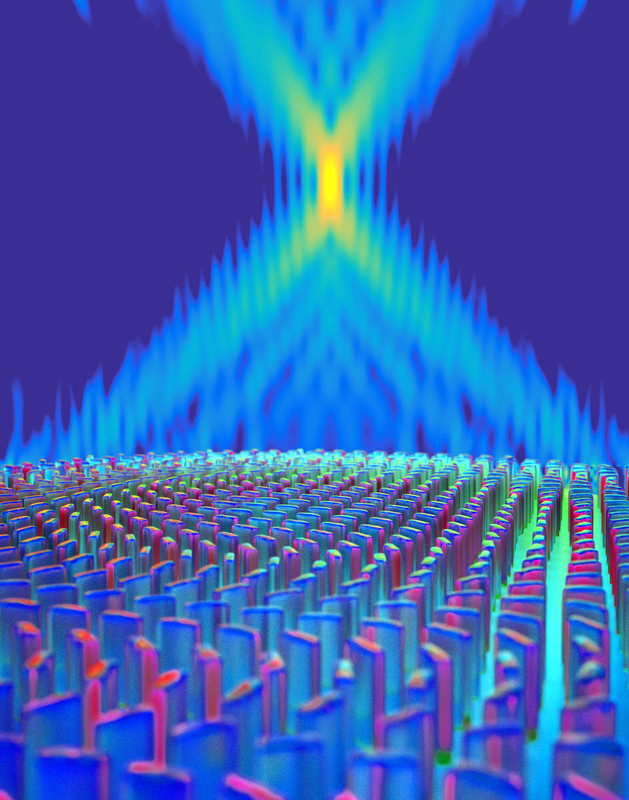 It uses an ultrathin array of tiny waveguides, known as a metasurface, which bends light as it passes through. The research is described in the journal Science. "Correcting for chromatic spread over the visible spectrum in an efficient way, with a single flat optical element, was until now out of reach," said Bernard Kress, Partner Optical Architect at Microsoft, who was not part of the research. "The Capasso group's metalens developments enable the integration of broadband imaging systems in a very compact form, allowing for next generations of optical sub-systems addressing effectively stringent weight, size, power and cost issues, such as the ones required for high performance AR/VR wearable displays." In order to focus red, blue and green light — light in the visible spectrum — the team needed a material that wouldn’t absorb or scatter light, said Rob Devlin, a graduate student in the Capasso lab and co-author of the paper. The team used titanium dioxide, a ubiquitous material found in everything from paint to sunscreen, to create the nanoscale array of smooth and high-aspect ratio nanostructures that form the heart of the metalens. 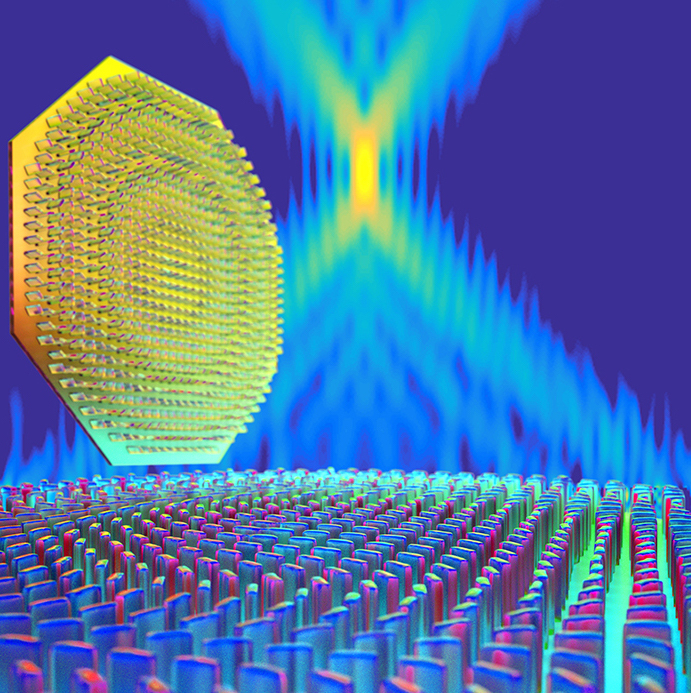 The team designed the array to resolve a structure smaller than a wavelength of light, around 400 nanometers across. 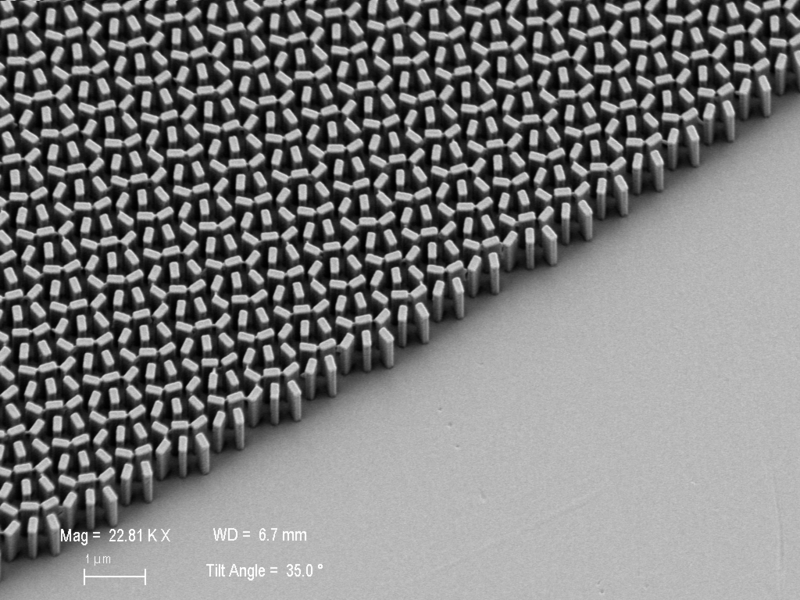 At these scales, the metalens could provide better focus than a state-of-the art commercial lens. "The amazing field of metamaterials brought up lots of new ideas but few real-life applications have come so far," said Vladimir M. Shalaev, professor of electrical and computer engineering at Purdue University, who was not involved in the research. "The Capasso group with their technology-driven approach is making a difference in that regard. This new breakthrough solves one of the most basic and important challenges, making a visible-range meta-lens that satisfies the demands for high numerical aperture and high efficiency simultaneously, which is normally hard to achieve." The paper was coauthored by Jaewon Oh and Alexander Zhu of SEAS. It was supported in part by a MURI grant from the Air Force Office of Scientific Research, Draper Laboratory and Thorlabs Inc.
An illustration of the ultra-thin planar lens. The lens consists of titanium dioxide nanofins on a glass substrate. The lens focuses an incident light to a spot smaller than the wavelength this tight focusing enables subwavelength resolution imaging. Image of a Siemens star formed by the meta-lens at wavelength 540 nm. Scale bar: 50 μm. 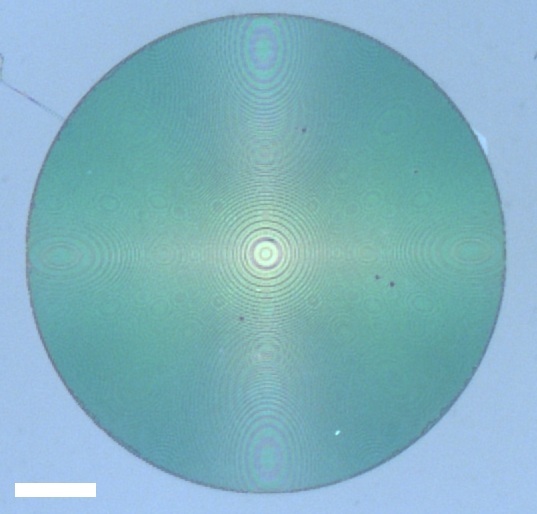 Optical image of the meta-lens designed at the wavelength of 660 nm. Scale bar: 40 mm.